As most of you already know, the hubs and I checked in for a staycation at the Four Seasons Hotel Toronto during the Easter Break. What most of you might not know is that the Four Seasons has always been our home away from home for almost all of our travels. The first time we checked in at the Four Seasons was for our honeymoon. 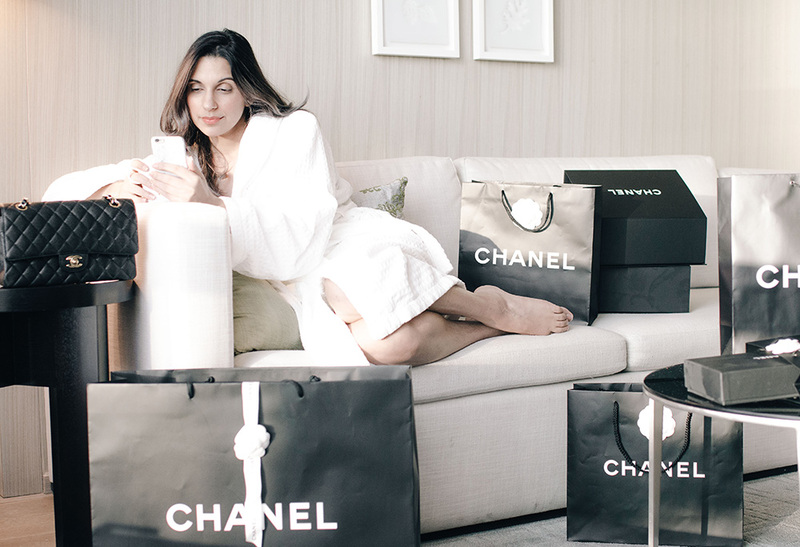 After our first stay at the Four Seasons, we were hooked on everything the hotel provided. 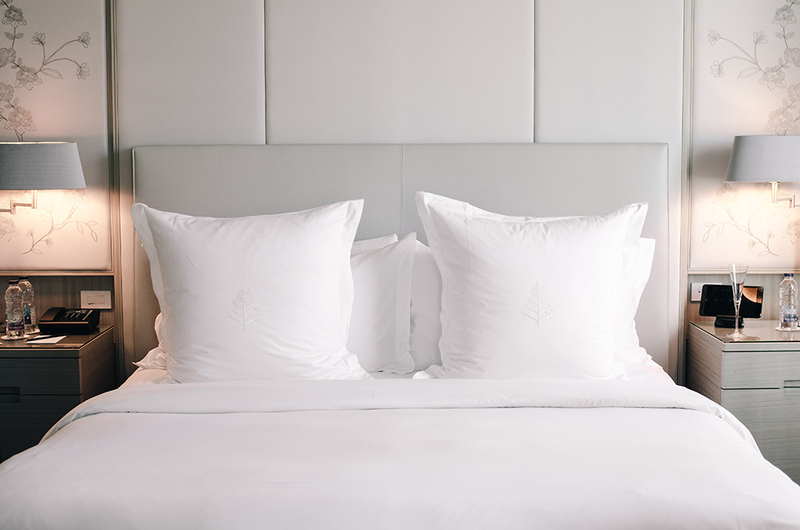 From luxe accommodation, ideal location, impeccable service, amazing restaurants within the hotel, and the little extra touches they always add to make our visit special (and make it hard to check-out). It makes no difference which Four Seasons you check-in to, you will get the same experience. Ever since we had our twins, the hubs and I have been working around the clock to take care of our babies. As a result, lately, we haven’t had much quality time together. So after he had his stressful week on call (yes, he was on call for a solid week), the staycation at the Four Seasons Hotel Toronto was just what we needed! The Four Seasons Hotel Toronto is located in the heart of the shopping district and my favorite neighborhood, Yorkville. It’s walking distance from Toronto’s favorite shopping boutiques and restaurant quarter. Within the hotel, you have access to one of my favorite restaurants, Cafe Boulud. There is also 30,000 square feet of space to relax at their spa and indoor pool, ample services to treat your kids (like a kid size chocolate bunny that magically had a security guard appear the next day when they found out I was aiming to nibble one of its ears), and their lobby bar d|bar. At check-in we found we got upgraded to their Corner One-Bedroom Suite and were quickly whisked away to our room where we were greeted with staff that set up a crib for our son, Zayn. I told you about the little touches Four Seasons does to make your stay extra special, and this one from Four Seasons Hotel Toronto just melted my heart. They even had a cute little robe for him! After doing some shopping, I went off to relax at their spa and take a quick dip in their indoor pool. I wanted to check out their outdoor terrace that has a gorgeous view of the city, sadly it was closed because it was raining. After building up an appetite, the hubs and I went off to d|bar at Four Seasons Hotel Toronto by Chef Daniel Boulud. I usually visit Cafe Boulud so it was nice to visit d|bar. I heard amazing things about their Crispy Artichokes and Nova Scotia Lobster Salad, and yes I ordered them and basically inhaled it! I committed the ultimate faux-pas as an instagrammer and did not take a picture of my food, I saw it and ate it promptly like a normal person lol. The next day, we took it easy and used their Nespresso machine before we ordered a huge breakfast (I am saying huge because it came with three sets of cutlery instead of two). Right after, I took a soak in our spacious bathroom and caught up on daily events with their TV in the mirror! No jokes! They have a TV in the mirror that turns into part of the mirror when you turn it off! After a long soak, Zayn got up from his nap so we got together in the living room and took advantage of our free movie ticket from Four Seasons Hotel Toronto. Oh, did I mention that they offered us complimentary room service that came with fresh buttered popcorn and drinks! After our movie, we just lounged in our robes and grabbed our last cup of coffee before we headed back home. At the end of the day, I have to say it was hard to check-out because we just didn’t want to leave. If you are visiting Toronto, the Four Seasons Hotel Toronto is a must. The location is perfect and the amenities and service were outstanding. If you live in Toronto and are looking to escape for a day or two, again Four Seasons Hotel Toronto is a must. I want to say thank you very much to Four Seasons Hotel Toronto for partnering up with me on this project. It was bittersweet checking out after feeling incredibly pampered and rejuvenated. 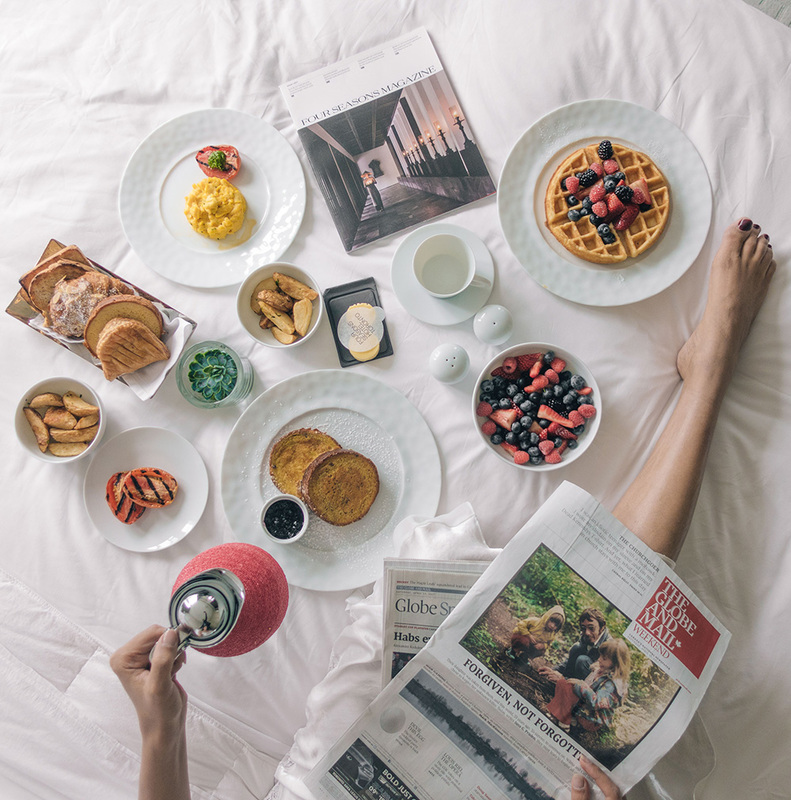 You made this mamma feel amazing that I cannot wait to come back again…I might even drop a few hints to the hubs so we can check-in for Mother’s Day and indulge at Cafe Boulud (rumor has it you serve an amazing Mother’s Day brunch). 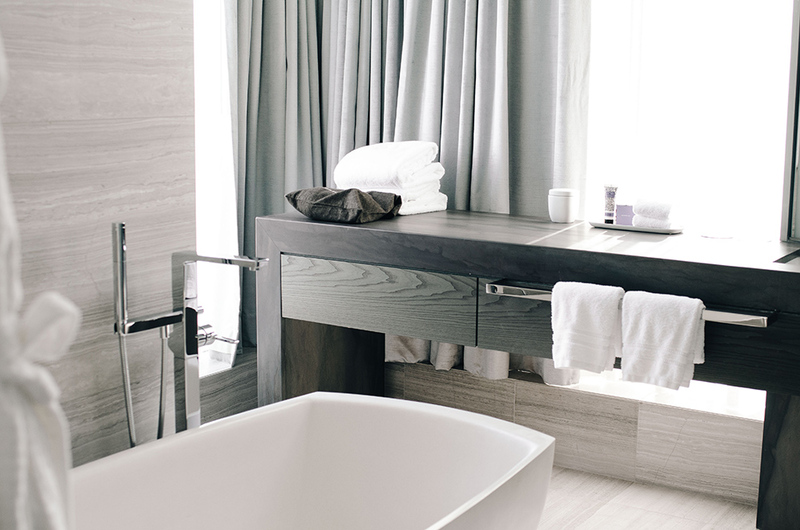 Disclaimer: This post was a collaboration with Four Seasons Hotel Toronto. All opinions are my own. looks amazing! hope you had the best time! I adore the Four Seasons hotels! This one is no exception. Love these photos and thanks for sharing your experience. aww you have such a perfect family! I have never been to Four Seasons hotel but it looks so beautiful and luxurious. I hope I will visit one day. And you baby is so beautiful, congratulations! Thank you so much for stopping by miri. You need to make a visit, but I’ll warn you…after your first visit you will be spoiled for lyfe! this is basically the best hotel i ever see! seems like i need to go there ASAP! It sounds like a perfect and cute gateaway! I hope you had the best time! This looks so cute and cozy!